OOOZU language cards are the same size as a credit card. Each card covers basic greetings, getting around, accommodation, shopping, eating out, times of day, days of the week and numbers. Keep in your wallet, purse or pocket so the words you need are close to hand. Lightweight – OOOZU language cards are so light you won’t feel you’re carrying them. Whether you’re taking a city break, backpacking or heading off on a family holiday, you can travel light with an OOOZU language card. Fast – When you need a word in another language you need it fast – in the few seconds before speaking to someone. With OOOZU language cards you can glance at a card in the time it takes to get a credit card out of your wallet or purse. That’s fast! 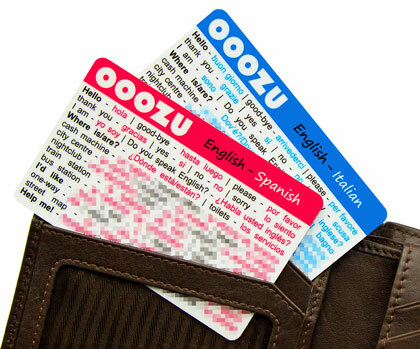 Durable – OOOZU language cards are made from biodegradable plastic. They’re as durable as a regular credit card. Great for skiing, hiking, camping, by the pool or on the beach. Discreet – It can be stressful speaking an unfamiliar language. Nobody wants to stand in a shop and look words up in a phrasebook. OOOZU language cards fit discreetly in the palm of your hand. You can glance at them without being too obvious, and without looking like a tourist! OOOZU language cards are the easy way to speak another language on holiday.